Evanston community members gather at Fountain Square to protest recent police brutality cases across the nation. The Black Lives Matter demonstration was set up by a group of ETHS graduates. 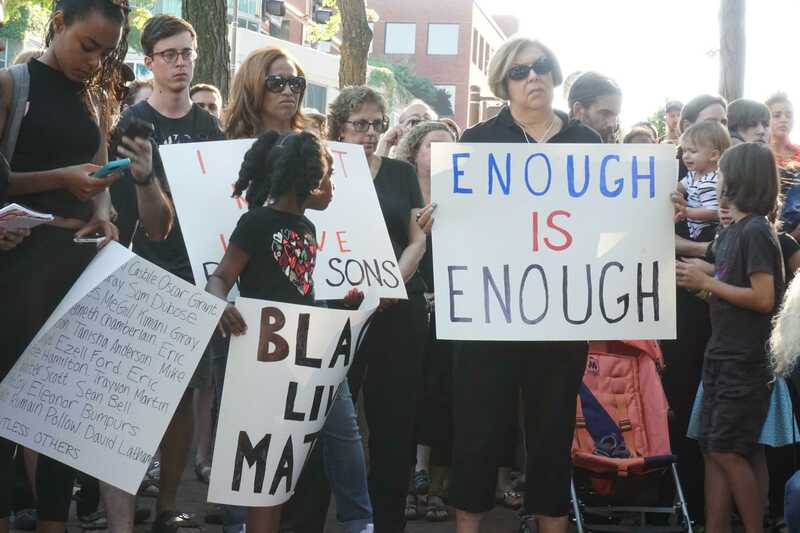 More than 250 Evanston and Skokie residents met at Fountain Square on Saturday evening to commemorate the lives of Alton Sterling and Philando Castile, two black men killed by police last week in Louisiana and Minnesota, respectively. The demonstration was coordinated by recent Evanston Township High School graduates Camille Allen and Spencer Nabors in less than 24 hours. It featured spoken word artists and speakers who memorialized the lives of Sterling, Castile and the more than 130 black men and women killed by police this year. Following a rendition of “Lift Every Voice and Sing,” often referred to as the Black National Anthem, Allen spoke about the national outcry sparked by the two men’s deaths. During the event, both Allen and Nabors emphasized the importance of having the Evanston community gather and reflect on these issues. Both women and some of their classmates read Facebook posts written by friends and teachers in reaction to the killings, while others shared original poetry written about police brutality. Rabbi Andrea London of Evanston’s Beth Emet synagogue and Reverend Michael Nabors of Evanston’s Second Baptist Church also spoke during the demonstration and commended the two young women on their leadership. “I wanted to say so much but so much has already been said and I will tell you that … there is a time for young people to speak and there’s a time for older people to listen, and this is the time for older people to listen,” Michael Nabors said. Spencer Nabors told The Daily she and Allen came up with the idea to hold a Black Lives Matter demonstration in Evanston the day before after deciding something had to be done to protest nationwide police brutality. Participants chanted “black lives matter” as the demonstration came to an end. Before the crowd left, participants were encouraged to speak to each other and with the rally’s leaders, sharing hugs and words of encouragement. Allen told The Daily she was happy to see so many people participate in the demonstration. The demonstration’s demographic was diverse, with different races, communities and age groups represented. Allen said she hoped the rally would inspire more young Evanston residents to make a difference. This story was updated at 9 p.m. to clarify the title of the Black National Anthem.